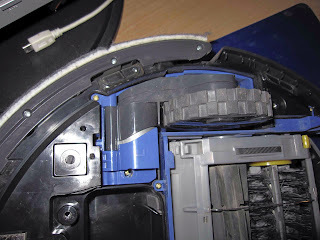 Today I was preparing my Roomba 780 for it's weekly home-cleaning job... and I noticed that the left wheel was very stiff. I searched online for some solution, or some disassembling guide. 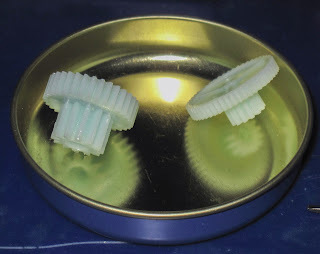 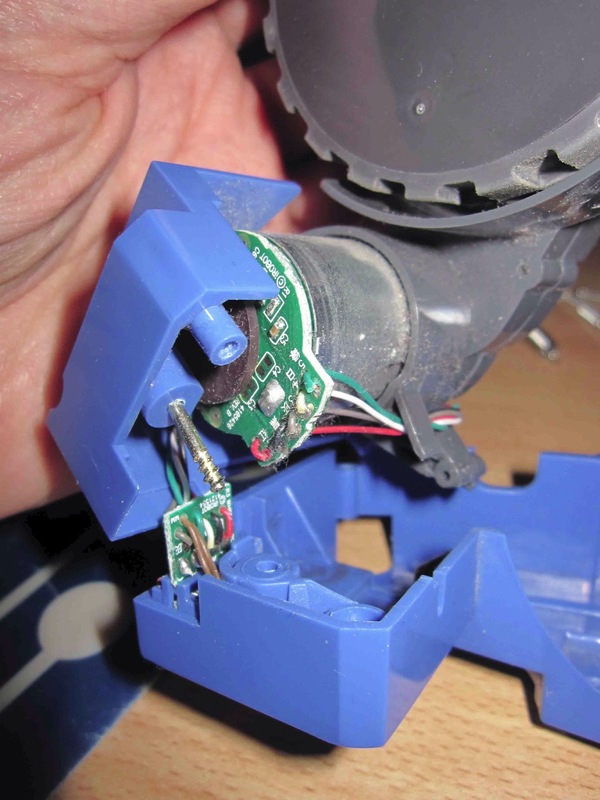 I found nothing usefull, so I'm going to report here my experience in Roomba wheel assembly dismounting, cleaning from debris/hair, and reassembly. 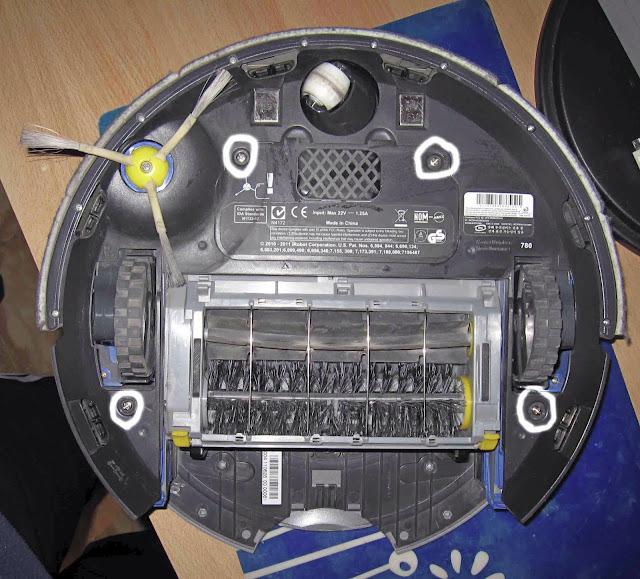 Place your Roomba upside down. Here is our Roomba ready for disassembling. 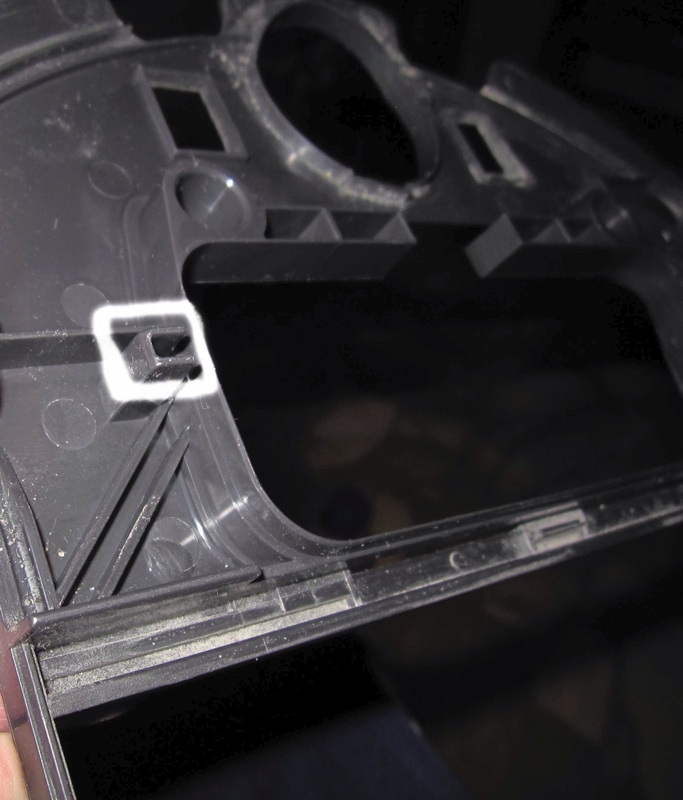 Gently pull up the bottom plastic cover. 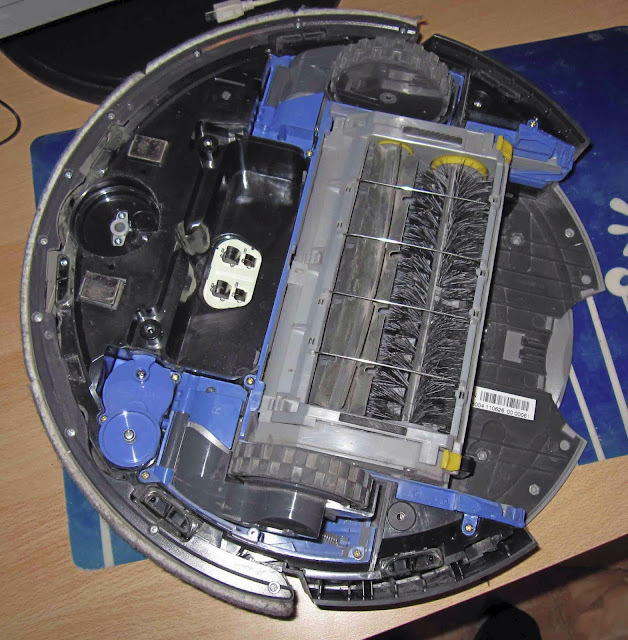 And now we have a bottom-naked roomba. 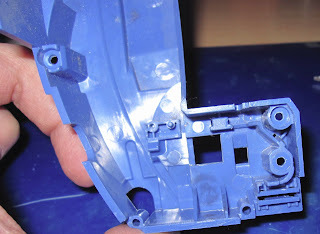 Here is a detail of the left wheel, the one I need to fix. 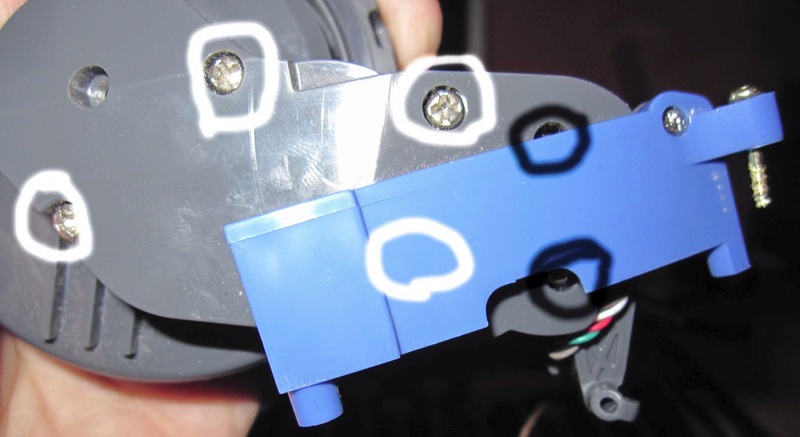 Remove the 3 circled screws. 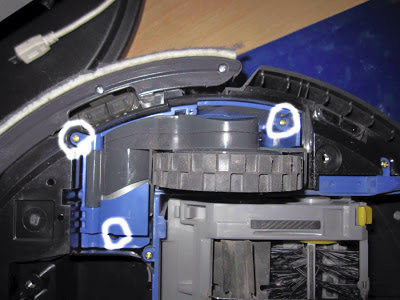 The right screw will come off, the 2 left screws won't come off (on my unit). After twisting off the 3 screws, you can pull out the wheel assembly. 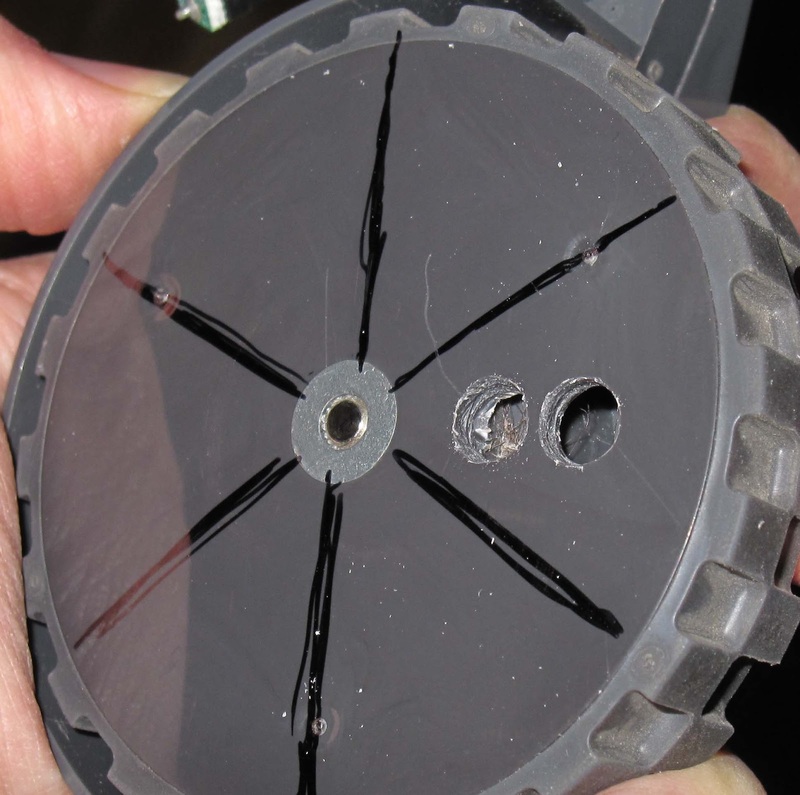 Here is the, now empty, "slot" of the wheel assembly. 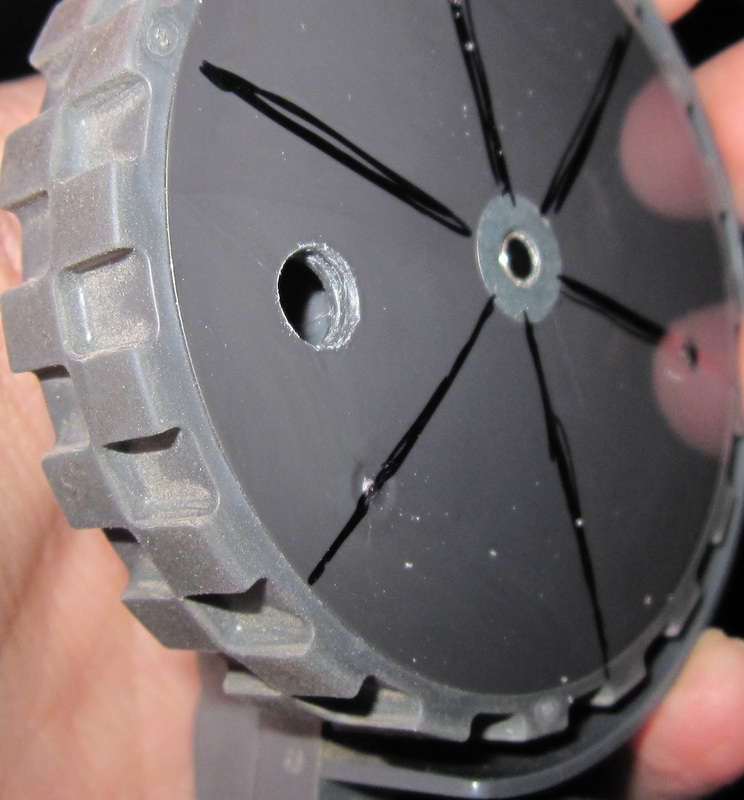 Here are some images of the wheel assembly form different points of view. 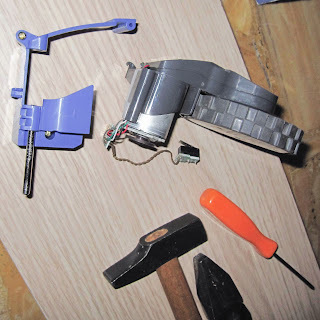 Now, let's take it apart. You should try to unhook the spring before twisting off the 3 circled screws. I didn't unhook the spring during my disassembly, the hooked spring made the disassembly a little harder. 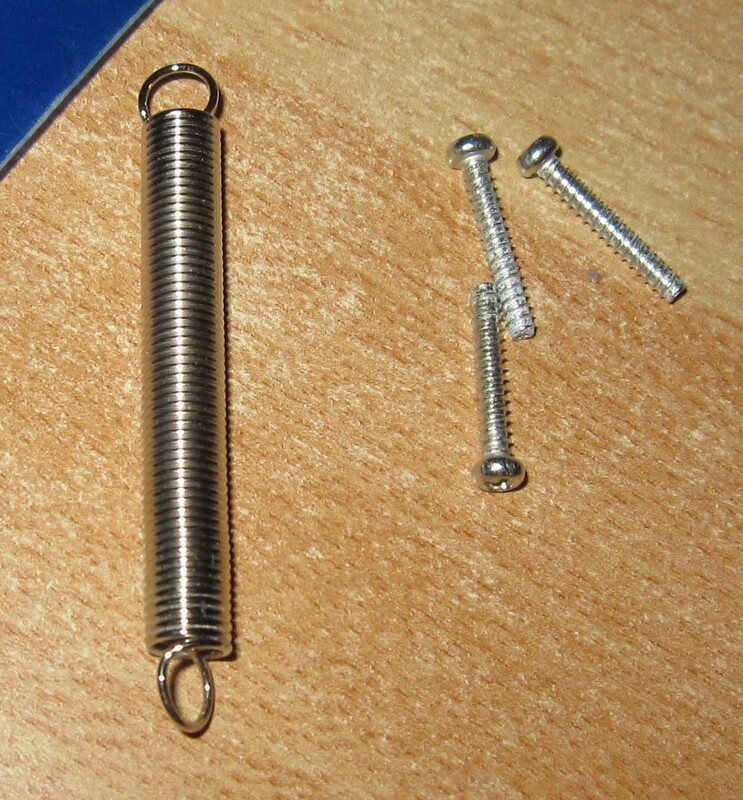 Pay attention to the spring, it's very strong, and it's hooked to tiny plastic hooks. 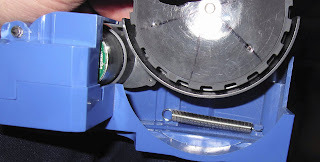 Here is the spring, and the 3 screws of the wheel assembly. 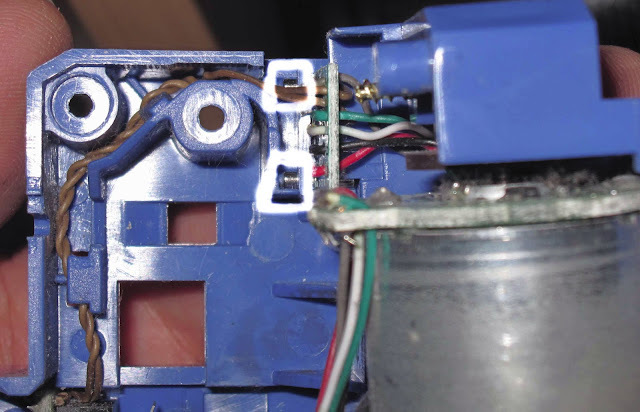 The electrical connector is in the lower part, and it's connected to the motor with some wire. 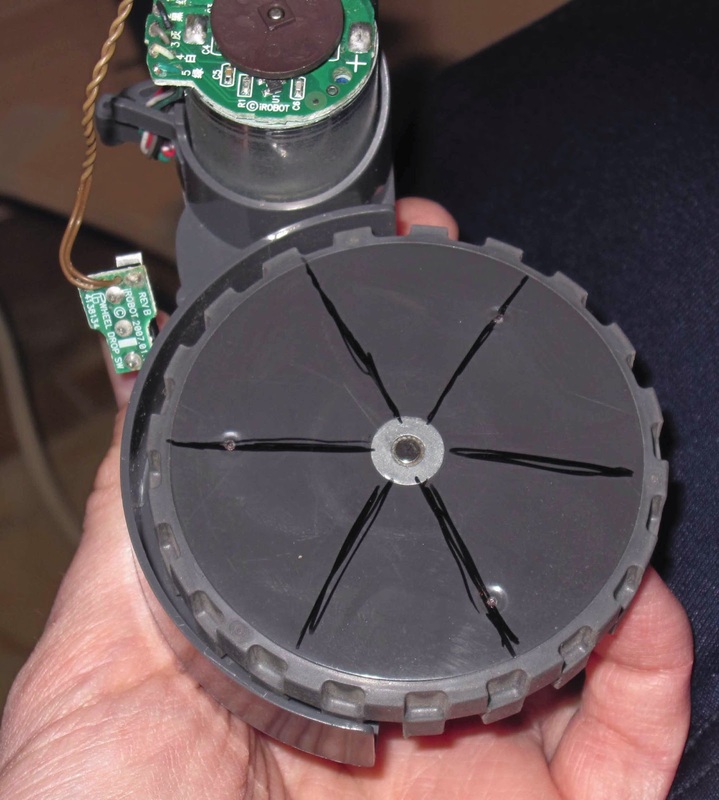 Here you can see the switch that detect if the roomba is placed on a floor (wheel pushed inside by the roomba weight when on floor) or not (wheel pulled outside by the spring). Here you can see the wiring from the switch to the connector. 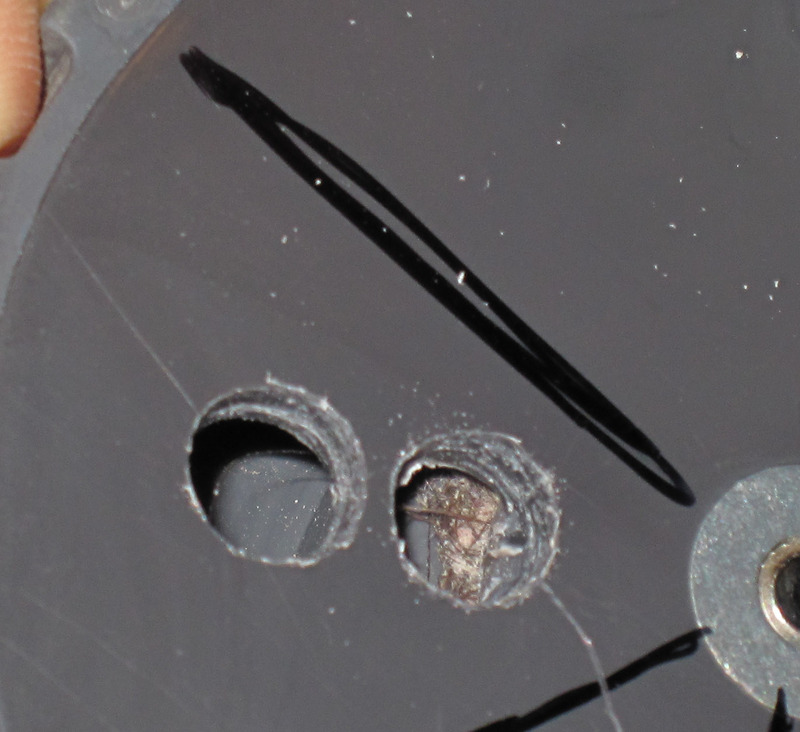 Squared in white, you can see 2 tiny metal pins: they are holding the connector in place. 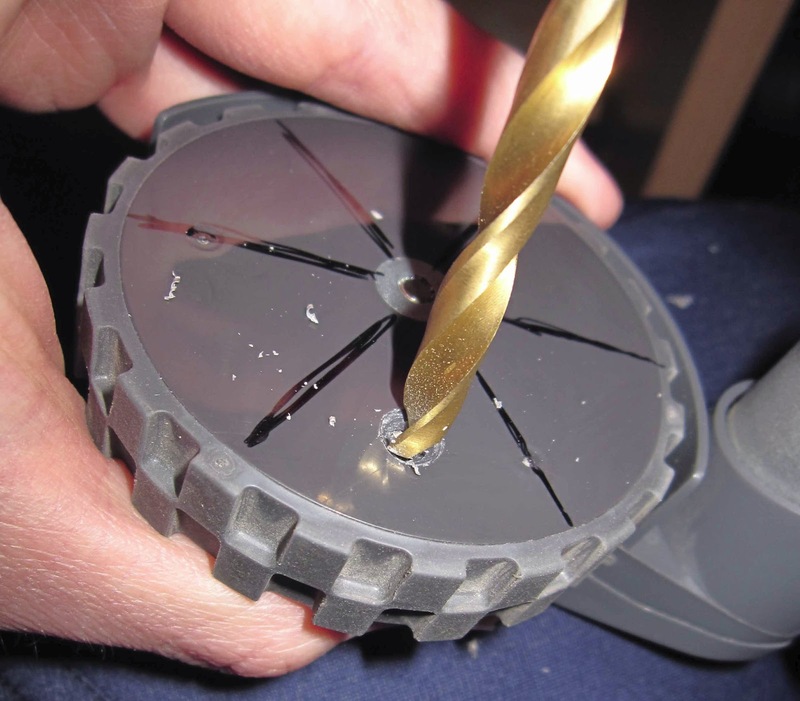 You should gently push them out with the tip of a tiny screwdriver. 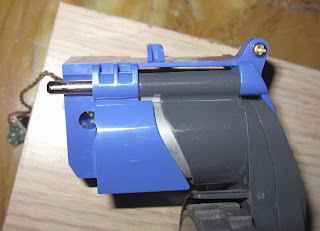 Use the screwdriver even to pull out the wire of the switch. Here is the lower part of the wheel assembly... naked. 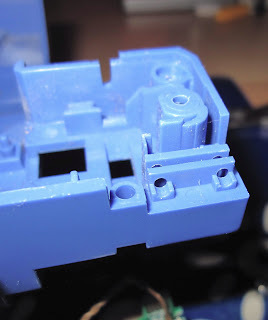 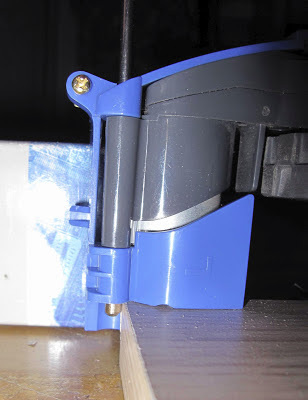 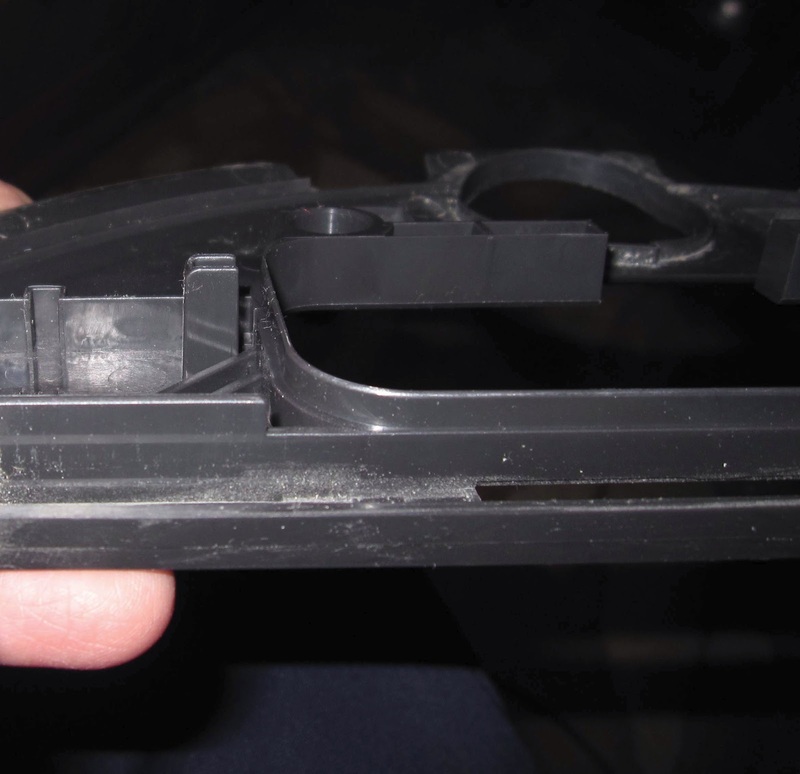 and here is a detail of the part that hold the electrical connector, you can see 2 holes for the 2 pins that hold the connector in place. And here we have the top part of the assembly, with the dismounted electrical part. 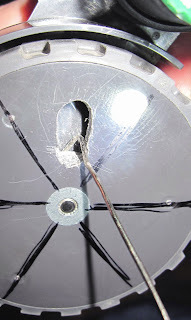 Now here is the tough part. 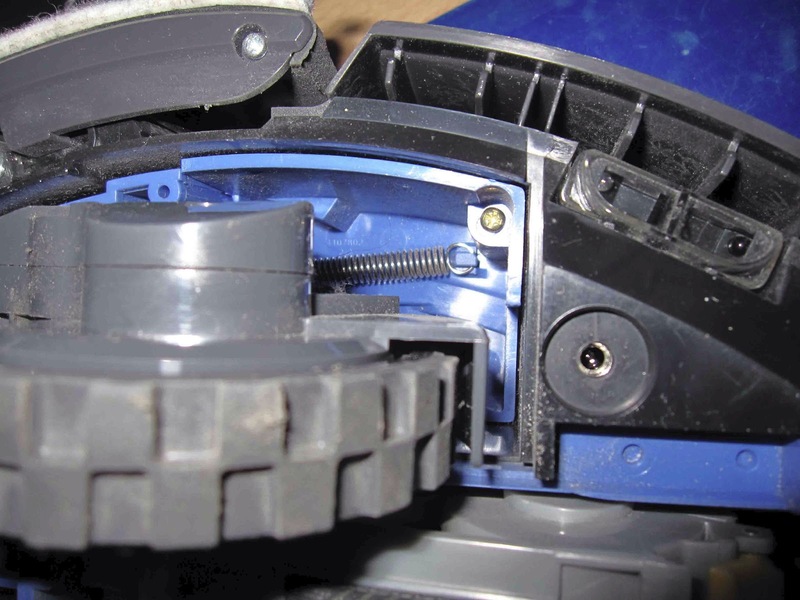 Disassemble the wheel gear box. 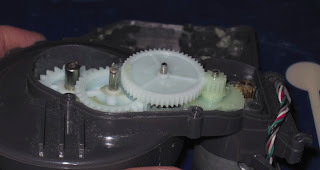 There are 6 screws that hold the gearbox together. 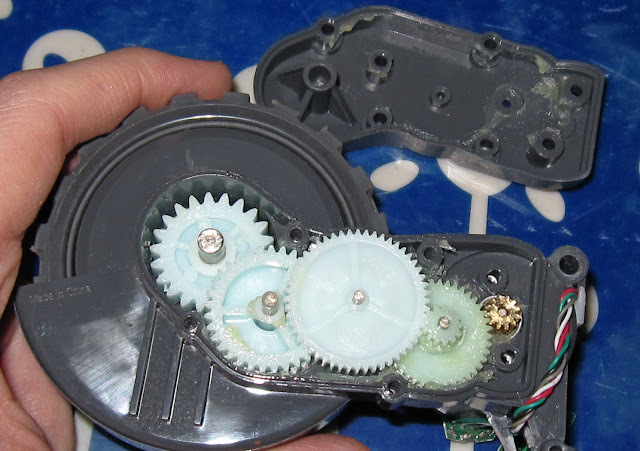 The 4 white circled screw hold the two pieces of the gearbox. 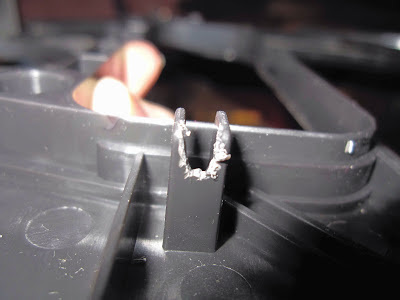 These 4 screws were very tight. 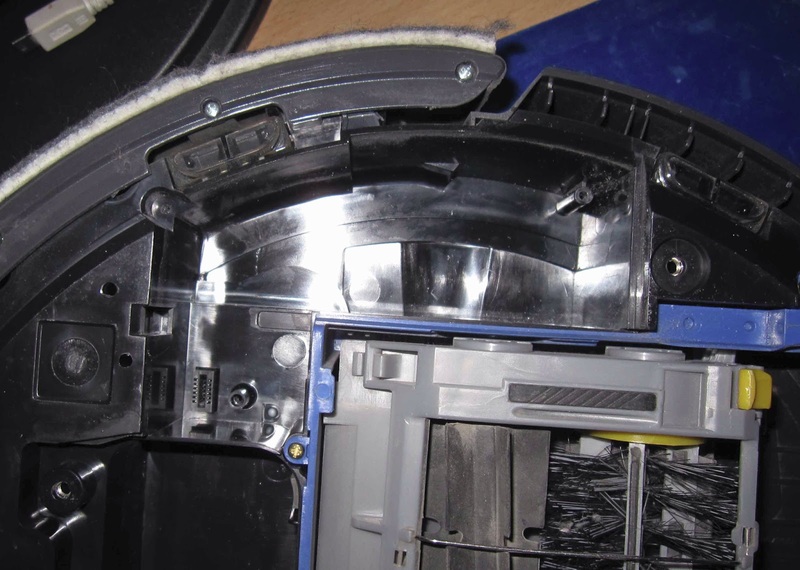 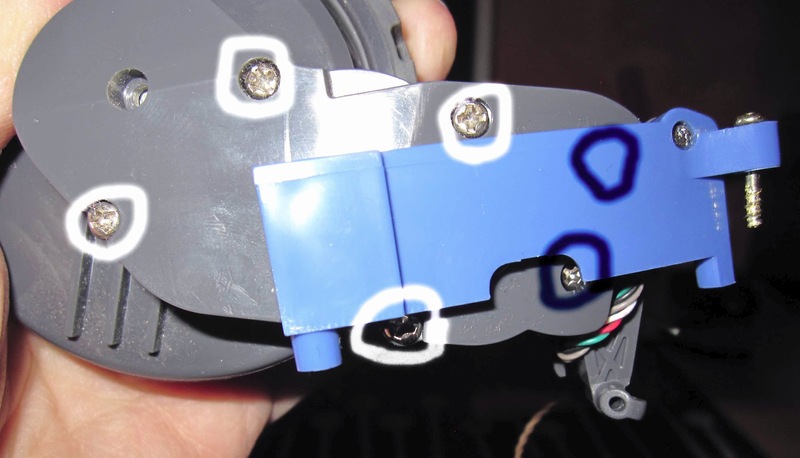 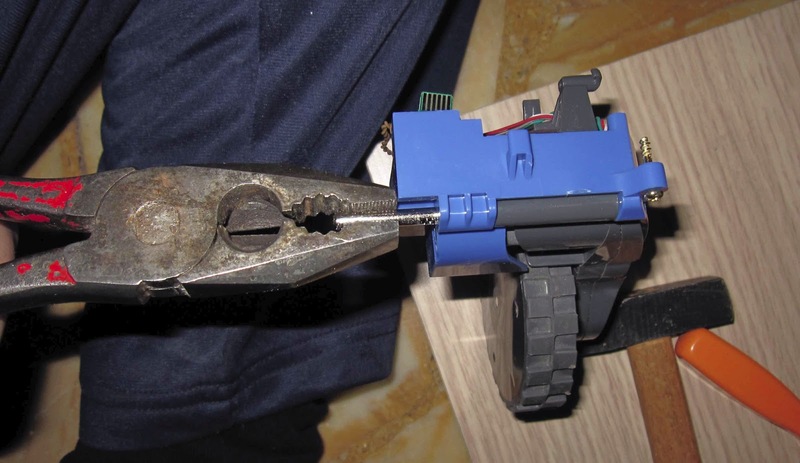 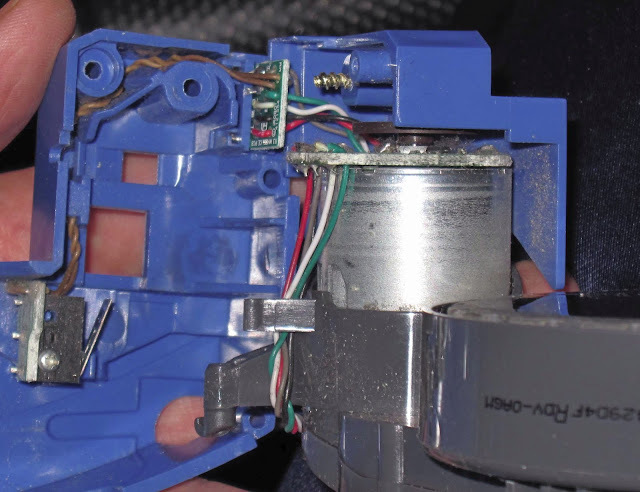 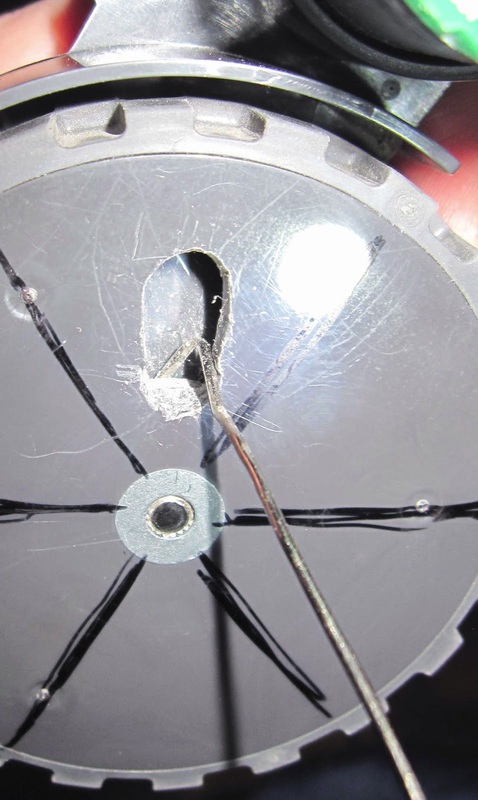 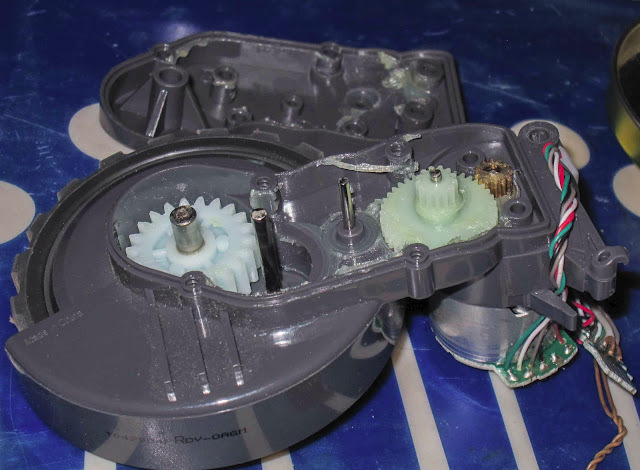 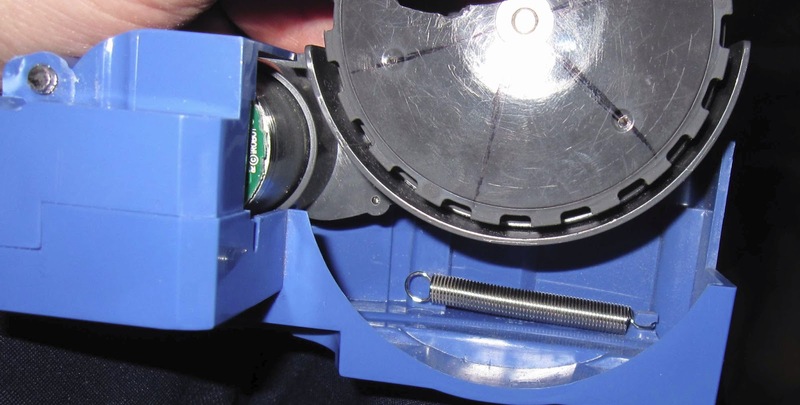 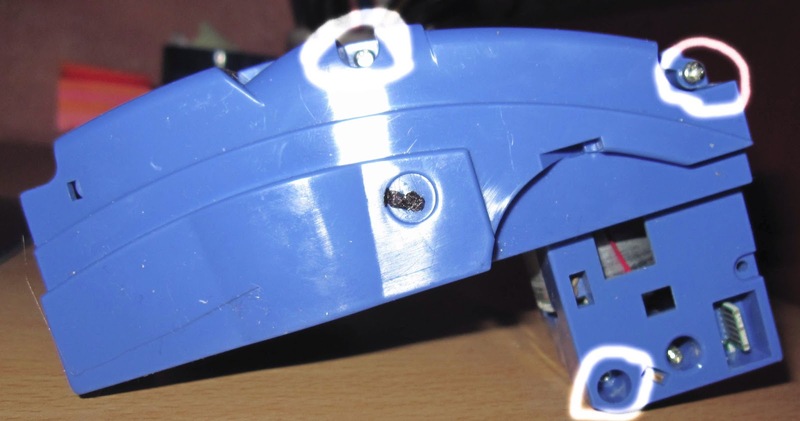 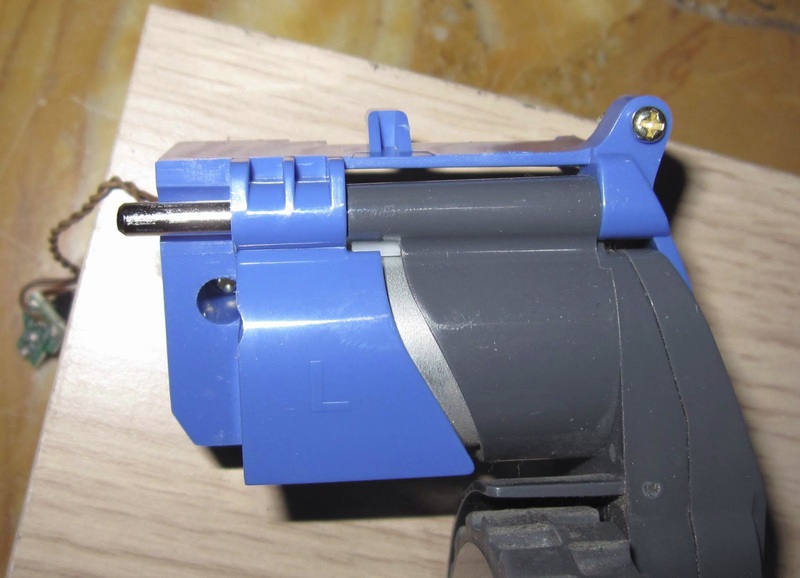 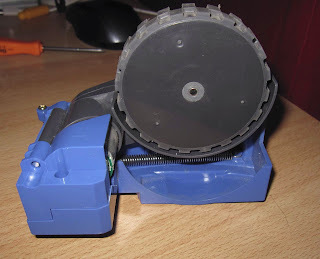 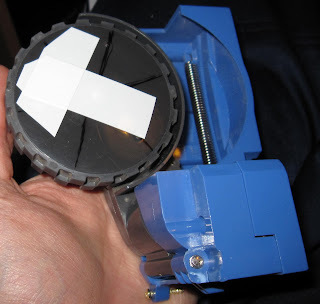 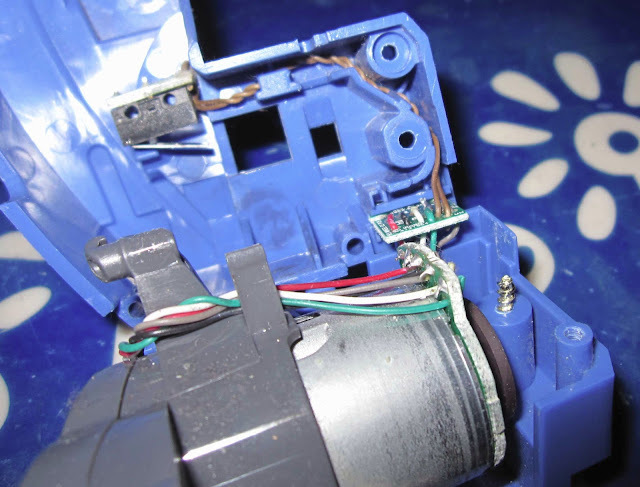 The 2 black circled screws keep the electrical motor attached to the gearbox. 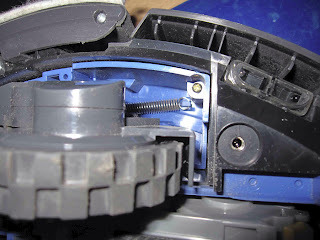 But the tough part is not the gearbox, but the pin that hold the grey gearbox to the blue wheel assembly. 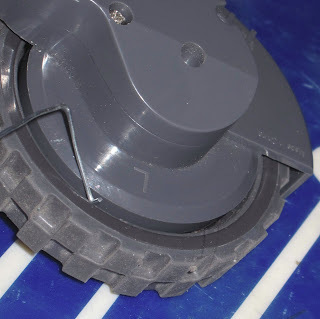 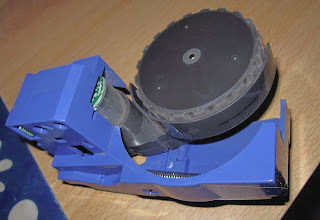 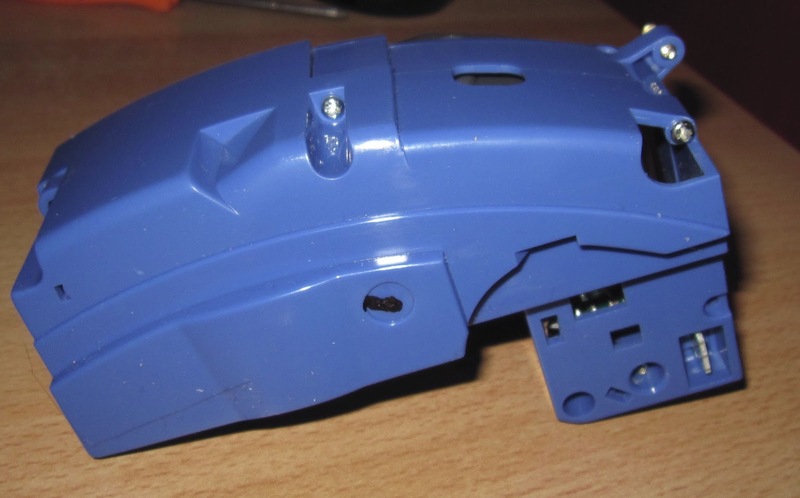 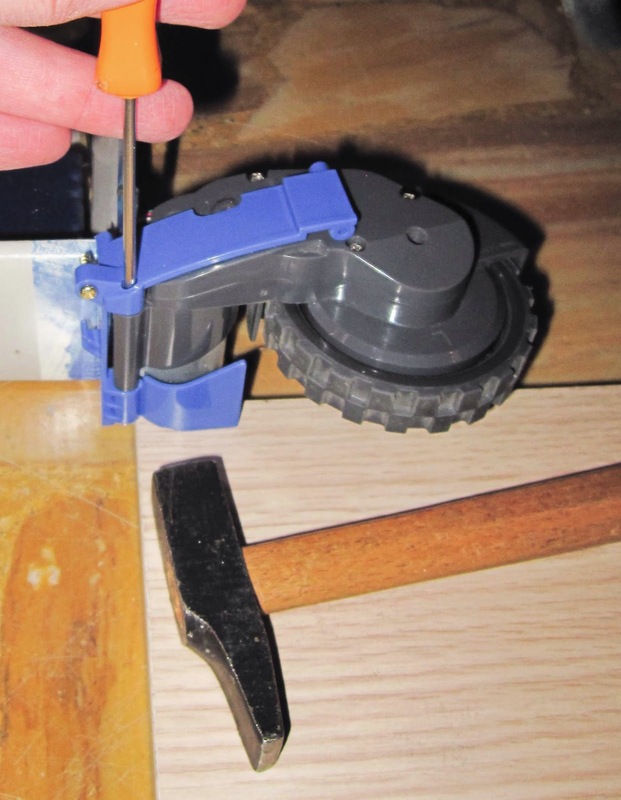 This big pin is fitted in the blue plastic, and in fact is the articulated joint that allow the wheel to move up and down. 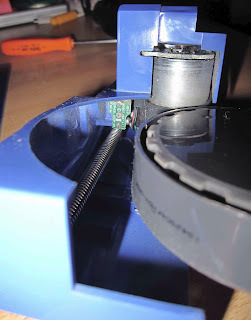 The only way to push the pin out is by using brute force, a screwdriver and a hammer. Find a good place, and start hammering the pin out. 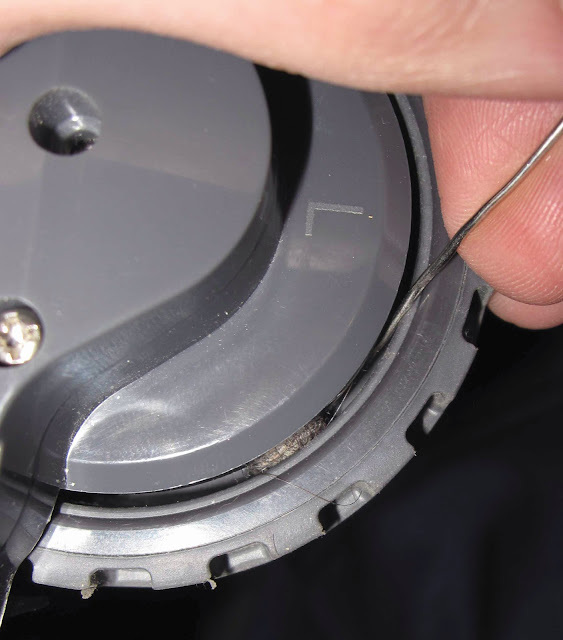 Here you can see the pin coming out. ...now I can use the pliers to finish the job. 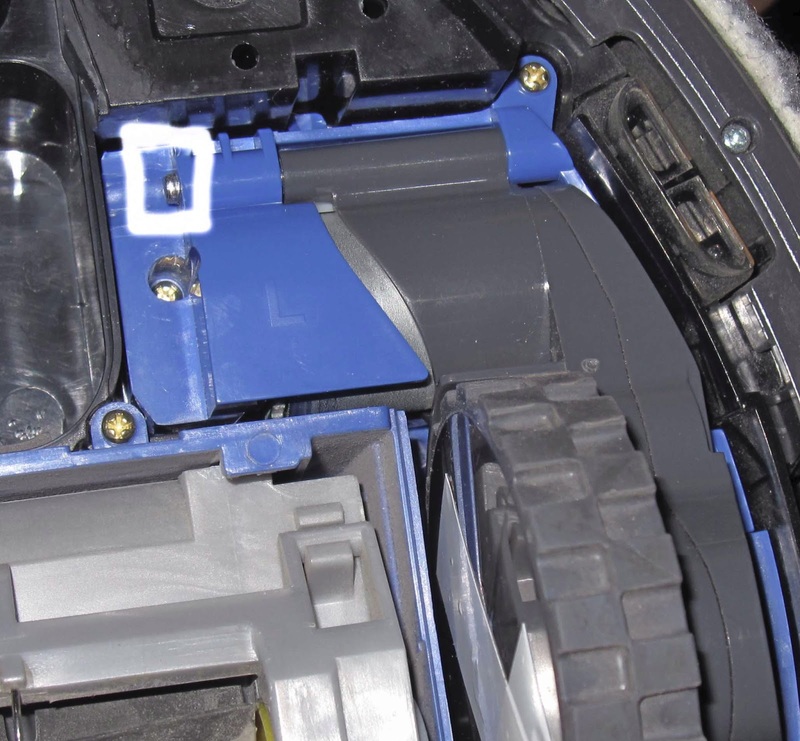 and here we have it: finally the gearbox is detached from his articulation. 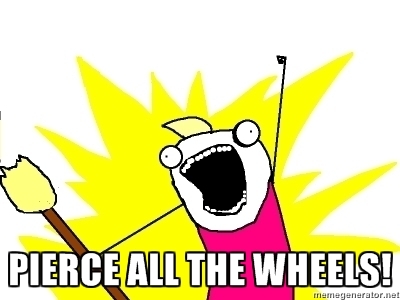 Well... at this point I've learned that I can't dismantle any further, the wheel and it's gear are firmly locked on their axis. 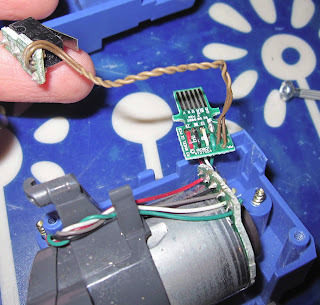 Now that I've ruled out the possibility that there was something wrong in the gearbox... let's try to clean the pin of the wheel. I've used some paperclips to create some hooks, to take out the debris and the hair. 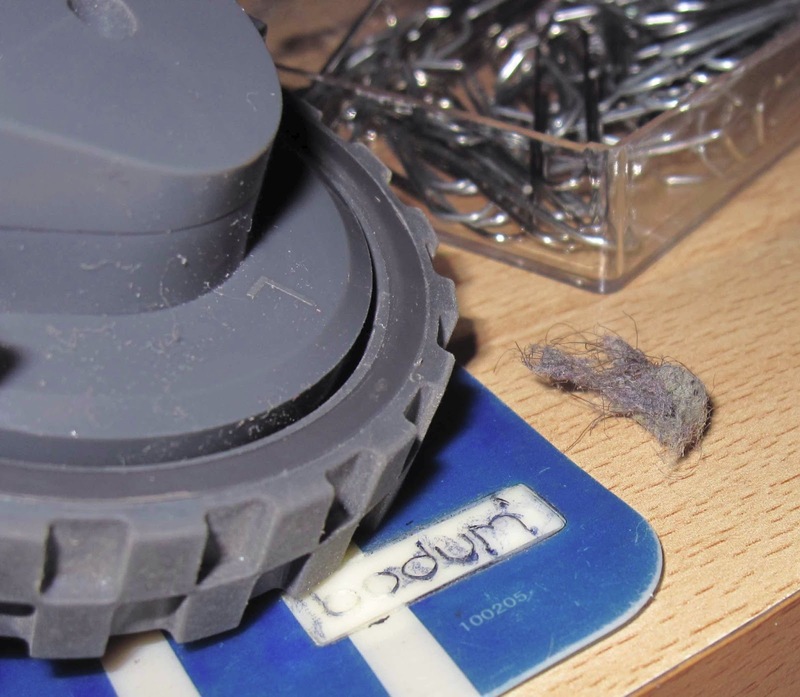 Here you can see a mix of debris and hair... there was a lot of them. The space you have to work with is very small, nothing bigger than 1mm can enter between the wheel and it's case. 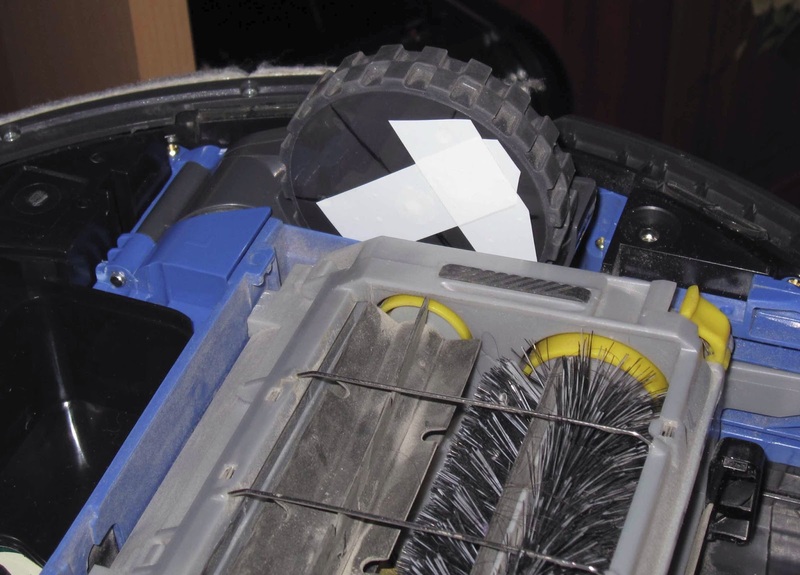 ...now I can clearly see the debris! And using some bended paperclip I can finally clean it for true. 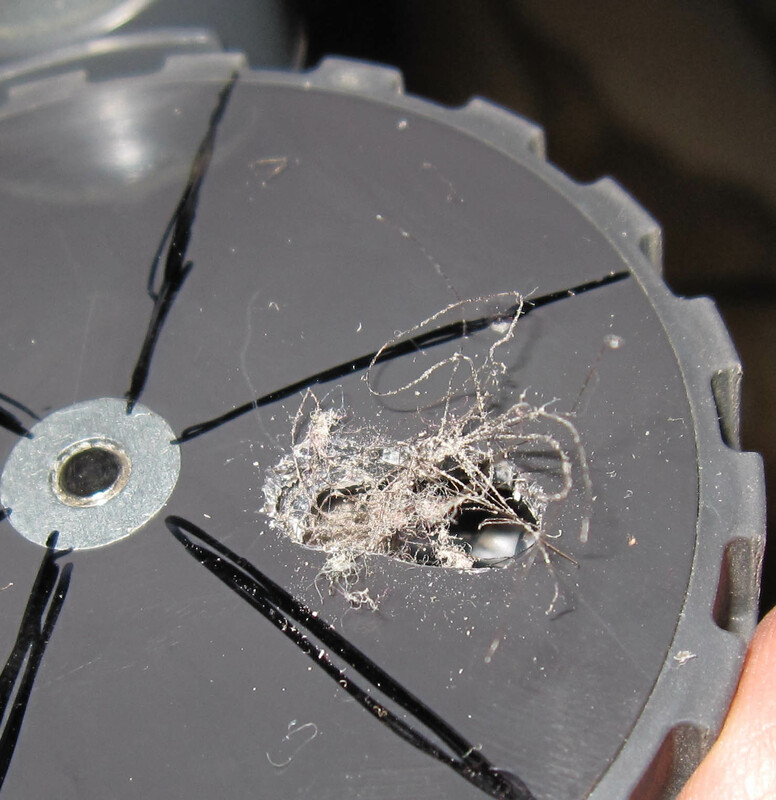 There were A LOT of hair/debris near the axis of the wheel. 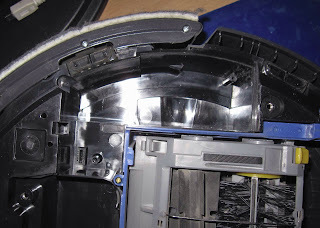 After cleaning, it's time to remount everything up. 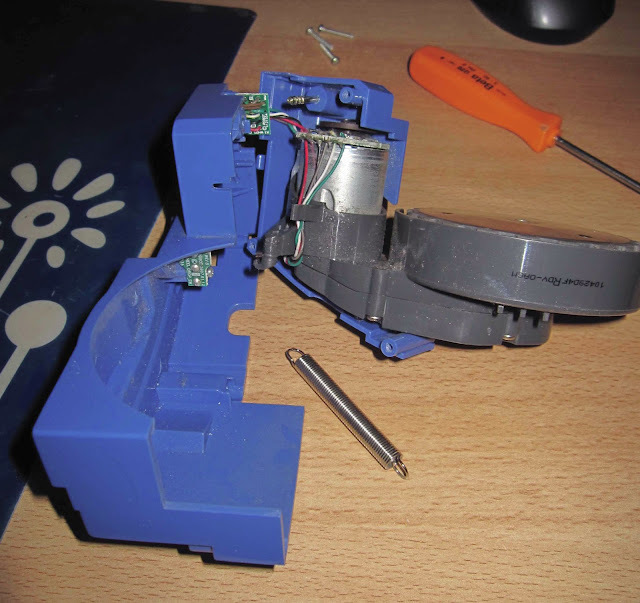 ...huston, we have a problem! This Roomba wheel assembly cleaning operations took me between 3 and 4 hours. 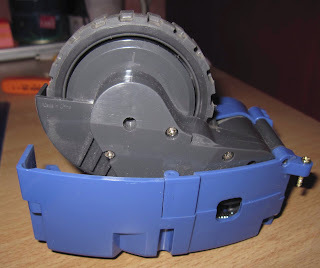 Now the wheel is spinning better, it's not as good as the other wheel, but its much better than before cleaning. Update: after cleaning some rooms with my roomba, now the cleaned wheel spin very well, it seem to be even smoother than the right wheel. 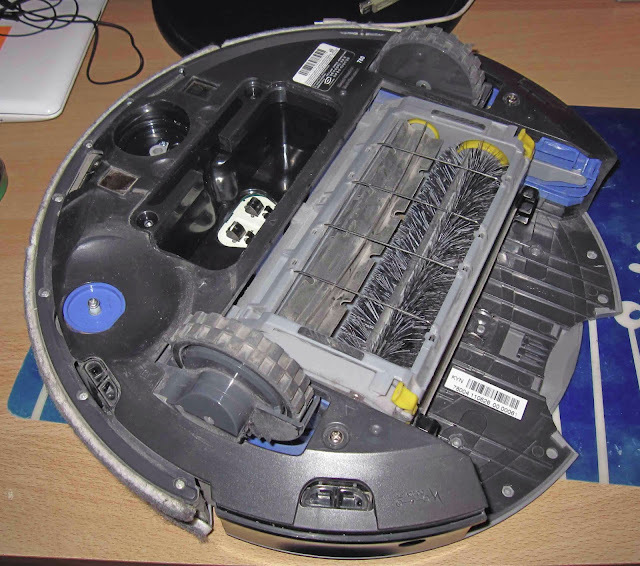 My roomba is about 13 month old, I use it every week in my home, each week it clean about 5 rooms.